Samsung aims to transform how businesses engage with mobile customers, starting first with the Coffee Bean & Tea Leaf. 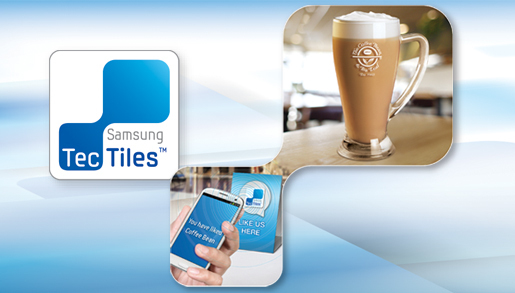 Samsung and Coffee Bean have embarked on an advertisement campaign to enhance the use of NFC. The two have placed Samsung-branded NFC stickers in all 51 outlets in Singapore, offering discounts to consumers. The combined advertisement campaign runs from 8 February to 7 March, and will reward Samsung NFC-device users with an upsized drink for tapping the poster and Liking Coffee Bean’s Facebook page after it pops up. We are not sure if other NFC users would be able to use it, but most likely, since NFC is a pretty generic protocol and should Mifare-compliant. Otherwise, the Samsung devices that are compatible would be the Galaxy S3, S3 Mini, Note, and Note 2 devices. Samsung claims that other NFC-enabled, Mifare-compliant Android phones should be able to work with its TecTile NFC stickers. Samsung is taking the opportunity to market the Samsung TecTiles. They are easy to program with the latest Samsung NFC-enabled smartphones, such as the GALAXY S III and GALAXY Note II LTE, and the Samsung TecTiles app is available for free download from Samsung Apps or Google Play. Samsung TecTiles are available at most Samsung retailers at an RRP of SGD 28 for a pack of five TecTiles but you could get generic NFC chips much cheaper from AliExpress. It’s interesting, though, to see NFC continue to be used in different ways by large vendors, although each brand not working with each other to move NFC forward is a huge bump in the road for the technology. The NFC ecosystem in Singapore has not really taken off, and the linkage to the payment system is still pretty much Telco-dependent. Furthermore, the iPhone’s lack of NFC capability isn’t helping the contactless situation, either. All three telcos have their own implementation of the NFC payment wallet system which requires an NFC-ready SIM card. While the Singapore government has been actively pushing for NFC adoption in the country, there’s no telling how long the technology will take to become mainstream. None of the services are anywhere close to Google Wallet. The closest implementation would be that from DBS and Starhub – the DBS One.Tap MasterCard® PayPass Card, which allows for payment through the linked mastercard via your phone. There’s no 3G on my Nexus 7 :( Gotta find one with Wireless@SG coverage or a Coffee Bean with Free WiFi provided, quite a number actually. Coffee Bean stores with Free-WiFi.